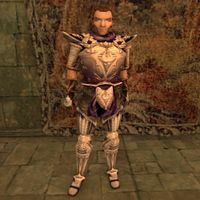 Varus Vantinius, an Imperial warrior, is the Knight of the Imperial Dragon, the head of the Imperial Legion in Vvardenfell. He can be found in the Ebonheart Grand Council Chambers. He will ask you to retrieve two powerful artifacts in the penultimate Imperial Legion quest and then challenge you to a duel for his title. "Have you found the Lord's Mail?" "If you follow all my orders, I will give you the rank you deserve." "You still want advancement? There can only be one Knight of the Imperial Dragon on Vvardenfell. To take my place, you must defeat me in an honorable duel in the Arena." "Chrysamere, sometimes called the Paladin's Blade, is a sword of legend. It was in the possession of the Legion for many years, but was stolen by a treacherous Knight. Our spies have heard rumors that it is now in the possession of Draramu Hloran, a powerful sorceress near Sadrith Mora, and no friend of the Legion. Kill her and return Chrysamere to me." "Have you not found it yet? It must be found!" "So you have found Chrysamere, and a fine blade it is! Return it to me and I will make you a %NextPCRank." Give him Chrysamere. [Disposition +4. Chrysamere has been removed from your inventory.] "Well done, %PCName. I applaud you. For what you have accomplished, I will make you a %NextPCRank." "Thank you for returning it." Draramu Hloran: "Our spies say she is near Sadrith Mora." "I'd rather die than lose my position as a Knight of the Imperial Dragon. Meet me in the Arena in Vivec for a duel to the death." "I'll be there. Will you?" [Shrine Key has been added to your inventory.] "The Lord's Mail is a cuirass, sometimes called the Armor of Morihaus. It has been kept in a Shrine on the lower level of the Imperial Commission here, but was recently stolen. Take this key. It will allow you entrance to the Shrine." "That cuirass is important to us, %PCRank. Find it quickly." "You have found the Lord's Mail! Well done, %PCRank. Give it to me and I will make sure it is well cared for." Give him the Lord's Mail. [Lord's Mail has been removed from you inventory. Duke's Guard Silver Cuirass has been added to your inventory.] "Yes, this is the legendary Lord's Mail, %PCRank. As reward, you are welcome in our Order here. Take this armor reserved for the Order of Ebonheart. I have another task for you. I want you to find Chrysamere." "You have returned the Lord's Mail. Now you must find Chrysamere." "You have returned the Lords [sic] Mail and found Chrysamere." Nevermind. "What? You are dangerously close to treason, %PCName. I will ask you once more: Will you give me the Lord's Mail?" "You have returned the Lord's Mail. Now you must find Chrysamere.."
"I have no orders for anyone who is not a Knight Protector. Check with Frald the White here in Ebonheart." "If you wish to become a Knight of the Garland of the Order of Ebonheart, I will need you to return two of the Order's possessions that have been stolen. The first is the Lord's Mail. Find it, and return it to me." "You have returned the Lord's Mail. Now you must find the Paladin's Blade, Chrysamere." "I have no more orders for you. If you still wish for further advancement, you must defeat me in an honorable duel to become the Knight of the Imperial Dragon." This page was last modified on 25 August 2016, at 19:42.